For five years, Wild Abundance founder and director Natalie Bogwalker lived at the Wild Roots Community. 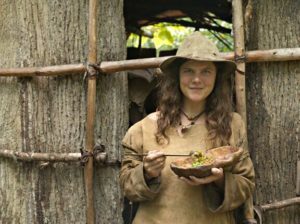 Her time there changed her life, and inspired her to share primitive living and homesteading skills with the wider world. Here we interview her about her life at Wild Roots and how it sprouted her school, Wild Abundance. When and why did you live at the Wild Roots Community? I moved there when I was in my early twenties, in 2002. I had been traveling in Central America, and when I returned my parents moved to Atlanta. At that point my dad got sick, so I moved in with them. I fell in love with the Southeast, and I wrote everyone I knew an email (which I had just started using), asking them if they knew of a community that was into wild foods in the Southeast. One of my friends knew the woman who had actually bought the land that became Wild Roots. She sent me the contact and I went to the very first Wild Foods Hike, with Frank Cook. There were eight people, two of whom I had known from other parts of the world, and I was like, “wow, this is the place for me to be!” I was really into wild foods, and botany, but I didn’t know much about primitive skills. Soon after the hike I decided to move to Wild Roots. We went to the Earthskills Rendevous and I started learning about hide tanning and other primitive skills and got really turned on to it. 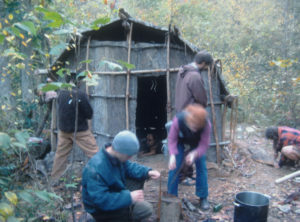 When you were living at Wild Roots, did you continue exploring primitive skills? What were the highlights of your years of being there? We lived, breathed, ate, and drank primitive skills. The water that we drank was from this very clean creek, and from a spring. The food we ate, not that much of it came from the store. We were growing food, and we were gathering even more food. Wild Roots is adjacent to a really lush section of the National Forest and we were gathering a lot of food. There were also a lot of hunters who would come through the land on a regular basis, during bear hunting season, and they would give us whole bears and we would process them, eat all the meat and tan the hides. I spent a lot of time perfecting hide tanning and wore pretty much exclusively buckskin. We did friction fire to start all of our fires, not at the very beginning, but we got inspired and eventually did. 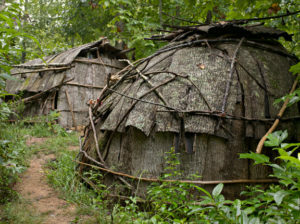 I learned from one of my mentors, who actually passed last year, Steve Watts, how to build a Catawba-style bark lodge. I built one and lived in it for a while. Then I built a small straw-clay cabin. I’d taken a bunch of natural building classes. We spent most of our time making crafts and practicing skills. Would you say, when you were living that lifestyle, that you were pretty fulfilled and happy? I was super fulfilled and happy. My body felt so good. I’d always been kind of clumsy, and walking barefoot, walking through the mountains, climbing up steep banks like a bear, coiling my body through rhododendron thickets, that all changed my relationship with my body. And I started eating meat. I had been vegetarian before. My body just felt so alive and vibrant. I was only in my mid twenties, but I had had a lot of back pain, I had been in an accident, and suddenly I felt good. I felt very connected with the web of life there, and that was awesome. One thing was I definitely had a lack of intellectual stimulation and challenge. That’s part of why I started the Firefly Gathering, along with wanting the share that lifestyle that I was so passionate about with other people. I also traveled around with Didi, another woman who lived at Wild Roots, giving presentations about “feral living.” We did that about a hundred times probably, in various colleges and universities and coffee shops. Then, after living at Wild Roots and feeling so good for five years, what inspired you to change your lifestyle and step back into the wider culture? A desire to share my gifts with the world was the biggest thing. And my gifts at that point were about primitive living, and I was really just so excited to share. I mean, I grew up in the country, outside of the suburbs, and went to school, and was really not fulfilled and didn’t have a lot of meaning in my life. And I think that’s really common. Then when I found primitive skills, primitive living, permaculture, and homesteading, it was so awesome for me and I felt this drive to make those things more accessible to more people. Over the years since I left Wild Roots I have become more of a homesteader and less of a primitive skills person. I had studied permaculture before going there, and was really into growing a garden and stuff. So now my life is a combination of those things [primitive skills and homesteading], and Wild Abundance is all about making them accessible to all kinds of people.